It’s been an ambitious and challenging project but the day to unveil it to the world has arrived. It’s a game, so first and foremost it’s fun to play – boring train journeys, queues for that gig or waiting for that friend who’s always late could be transformed into exhilarating space adventures. But that’s not the exciting bit. Well it is. But there’s more. Much more. By downloading and playing this pioneering game, you will be taking part in research to help beat cancer. It might sound far-fetched, but it’s true. 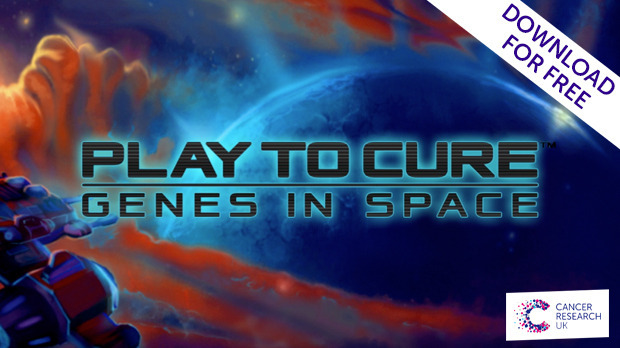 We’ve been working with our scientists and gaming experts for months to build the game, which on the surface is a simple and entertaining caper through space. But underneath it’s a data crunching powerhouse that’s helping our scientists identify the DNA faults that could lead to cancer. In the game, you take the helm of a spaceship to collect valuable and powerful ‘Element Alpha’. The stroke of genius is that in doing so you are actually helping our scientists to analyse piles of real life data. That’s because the game is actually a fun interface to allow the public to assist our scientists in the serious business of spotting patterns in gigabytes of genetic information from thousands of tumours. There’s lots more information about the fascinating science behind the game in this post. But in a nutshell, by finding the best route to pick up the most Element Alpha, you’re actually plotting a course through genuine ‘DNA microarray’ data. Posted on February 18, 2014, in Research, Games and Health and tagged Game based learning, serious games, Science, games-based learning, Play to Cure, genes in space, Croud Crunching Data, Cancer Research, games and medicine, biology, dna, dna microarray. Bookmark the permalink. Leave a comment.